Yesterday, as I took the train home from work, a strange thing happened as we rolled through the 135th Street stop. Normally, for reasons unknown, the A Train slows down to about 5 miles per hour as it goes through the 135th Street station. It skips this stop when going express but travels so slowly through the station that I've always wondered why they don't just stop there anyway. It was about 9:00PM and I was just leaning my head against the glass, listening to my podcasts and staring blankly out at the dreary station as we rolled through. The station is always nearly vacant. Maybe one or two people will be on the platform but I've never seen more than 5-10 people in the entire station stop. Yesterday was no different. However, as we approached the very end of the platform, about to re-enter the tunnel, I noticed a gentleman at the very end standing by one of the dumpsters. I took karate in my youth so I was easily able to identify that he was standing in a classic horse stance, legs spread far apart. 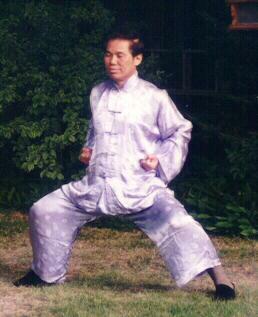 Sifu Wong practicing the horse stance. This would not have been that unusual in and of itself. It's not uncommon to occasionally observe people doing weird martial arts poses or practicing Tai Chi. It this was Tai Chi, it was a form that I am not familiar with. This man had both hands stretched out towards the train. The middle finger of his left hand was extended as high as it could possibly go, with his remaining fingers left down. It seemed that he was trying to focus all of his energy into his middle finger and somehow direct it at the train. 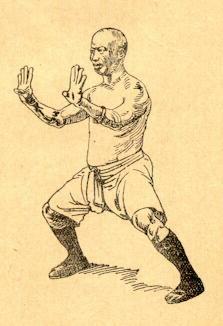 Such was the chi that he was summoning that he had to brace his lower body, thus the classic horse stance. In fact, the horse stance was not his sole means of supporting the immense raw energy being generated by his extended middle finger. He was further supporting his left wrist by gripping it tightly with his right hand. I found this to be very responsible of him. Who could tell the damage that may be caused if errant energy from his finger was blasted around the subway station. master, holding up seven more fingers than the gentleman I observed. We have all been waiting for a train on a local platform only to be passed by express trains. Perhaps the annoyance I felt at continually rolling through 135th Street at five miles and hour was akin to him constantly watching the train roll through 135th Street at five miles and hour. To me it was an annoying speed bump. To him it was a slow, lumbering taunt as he waited for a C train that wouldn't come. I think we've all wanted to do what this man was doing. He was just courageous enough to actually do it. Ha that man is a hero! One day god willing I will summon up enough chi to stop buses. He was flipping off that train AS HARD AS HE COULD. He was doing Kung Fu. Not Karate.